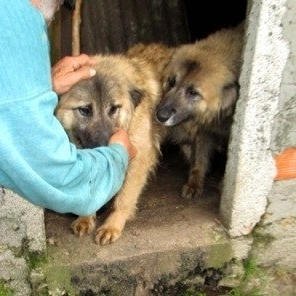 Dante was the first Estrela to be rescued from the container. We were allowed to take him away because he had a bleeding wounded ear. As none of the dogs were used to human contact a lot of patience and love was needed to gain his trust. Now he is perfectly in harmony with us, although he keeps a distance to strangers. We try to socialize him by taking him out to our village and the first results are very promising. We expect he will be ready for a responsible adoption soon. Tristan came to us as the result of the first rescue trip together with his mother Camilla and sister Electra. They were rescued out of a cell with no light at all. 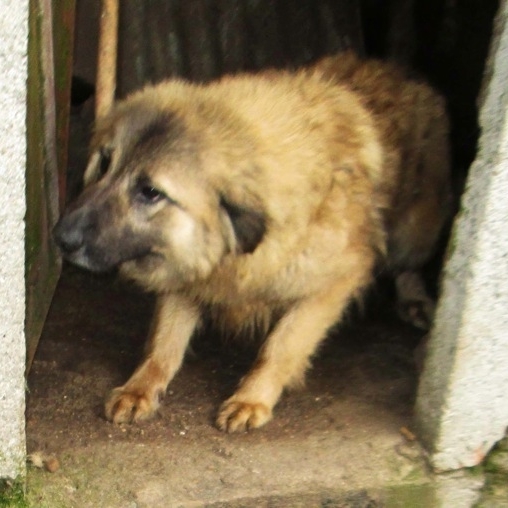 Because they were so afraid of everything, afraid of daylight, afraid of people and even afraid of other dogs, we believe that they were not allowed to leave their prison cell very much, only for cleaning. We put the three of them in our specially built kennel, where Tristan and Electra hid 24 hours a day under their mother Camilla. It took several months for Tristan to gain confidence in us and in himself and now, March 2015, eight months later he enjoys running free in our garden. He walks reasonably well on a lead and soon we can try to take him for walks outside our property. However, taking him out for a walk in the village with all the traffic and strange noises and people, will still be too much for him. It will take at least another year before we can consider adoption. Florence was locked up in a very small concrete hut together with her mother Francesca. 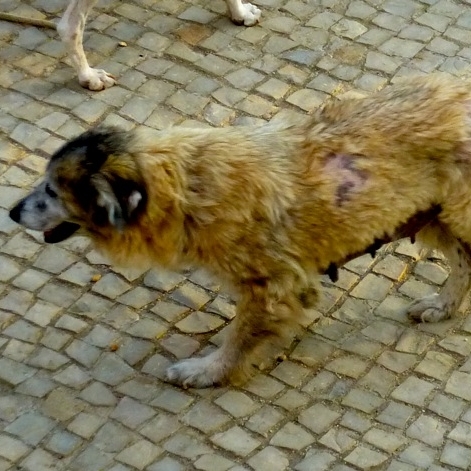 She was one of the last Estrelas we could rescue. 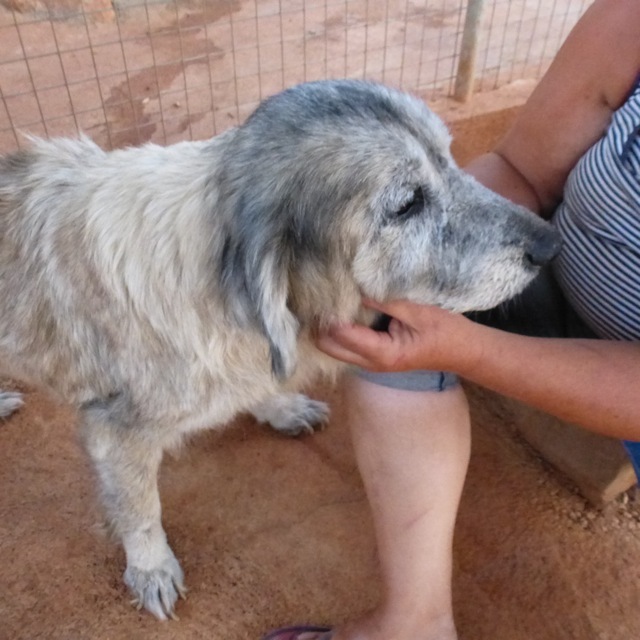 As none of the dogs were used to human contact a lot of patience and love was needed to gain her trust. As she is focussed on food and treats that was not too difficult. Now she is perfectly in harmony with us, although she keeps a distance to strangers. We try to socialize her by taking her out to our village and the first results were not bad. Taking into account that these dogs have never seen other people, cars, traffic or experienced street noises etc. our conclusion was that there is hope. Camilla came to us as the result of the first rescue trip together with her daughter Electra and son Tristan. They were rescued out of a cell with no light at all. Because they were so afraid of everything, afraid of daylight, afraid of people and even afraid of other dogs, we believe that they were not allowed to leave their prison cell, except for cleaning it out.. It took several months for Camilla to gain a little bit of confidence in us and in herself and now, March 2015, eight months later she enjoys running free in our garden. Walking on a lead is still a little bit too much for her. But she enjoys life and running around in her kennel which she shares with Dante and Francesca. Sometimes she hides herself in a hole she digged underneath a wooden pallet. It will take at least another year to have her ready for adoption. Electra came to us as the result of the first rescue trip together with her mother Camilla and brother Tristan. They were rescued out of a cell with no light at all. 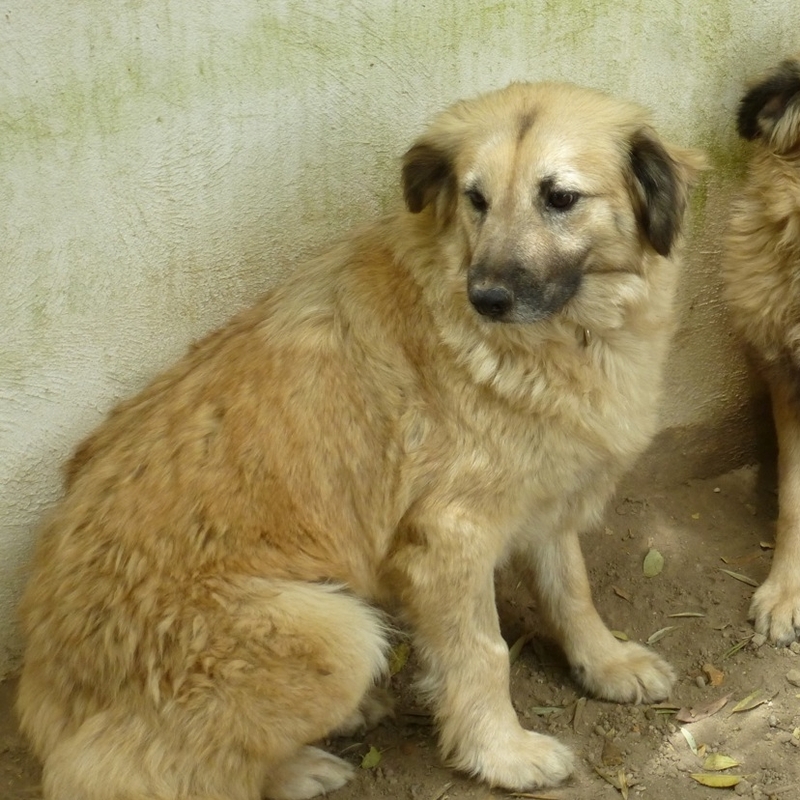 Because they were so afraid of everything, afraid of daylight, afraid of people and even afraid of other dogs, we believe that they were not allowed to leave their prison cell ever. We put the three of them in our special build kennel, where Tristan and Electra were hiding 24 hour a day underneath their mother Camilla. It took several months for Electra to gain a little bit of confidence in us and in herself and now, March 2015, eight months later she enjoys running free in our garden. But only on a 5 meter long line, because otherwise we are unable to catch her. When there is no room to escape we can touch and cuddle her. However, at the first possibility to escape she will run away and hide in a far corner of the kennel. We fear that it will take many years to have her ready for adoption. Maybe never. 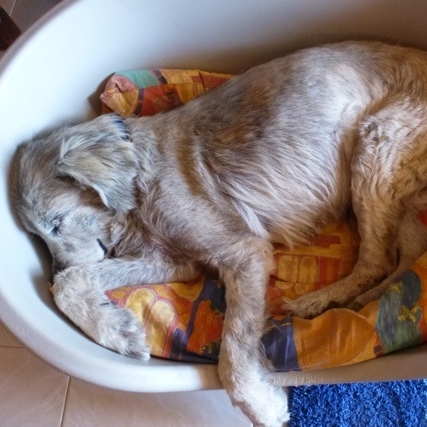 Francesca came to us as the result of the second rescue trip together with her daughter Florence. They were rescued out of a cell with no light at all. Because they were so afraid of everything, afraid of daylight, afraid of people and even afraid of other dogs, we believe that they were not allowed to leave their prison cell ever. It took several months for Francesca to gain a little bit of confidence in us and in herself and now, March 2015, eight months later she enjoys running free in our garden. But only on a 5 meter long line, because otherwise we are unable to catch her. When there is no room to escape we can touch and cuddle her. However, at the first possibility to escape she will run away and hide in a far corner of the kennel. 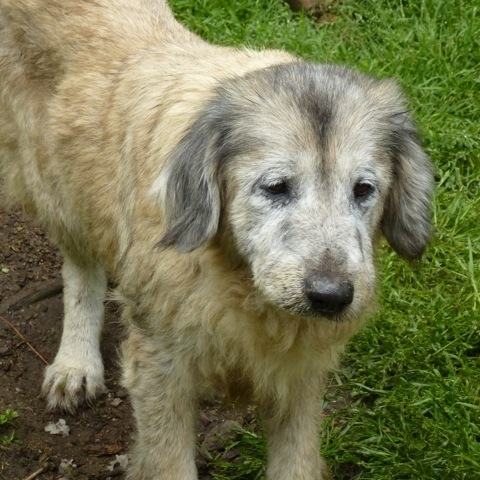 We fear that it will take many years to have her ready for adoption or never. 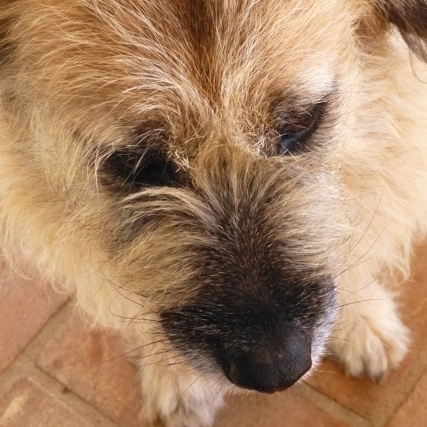 Truusje went to join all her ancestors over the Rainbow Bridge today, Bless her poor little soul. Took her to vet in Faro last week where she was diagnosed by ultrasound and blood tests as having liver and spleen tumours. Did what they could but we know they don't recover from that type of cancer and not at her age. Put her to sleep very peacefully this afternoon at the clinic with Sofia and me beside her. 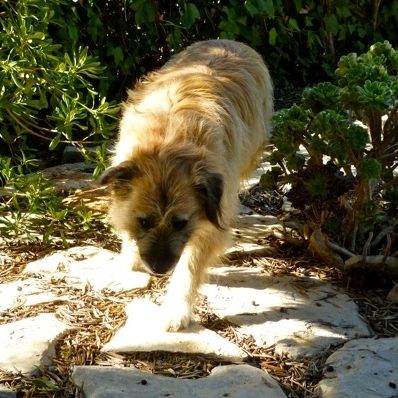 Took her home and buried her in our doggy memorial garden next to Troika who died of old age a few months ago. 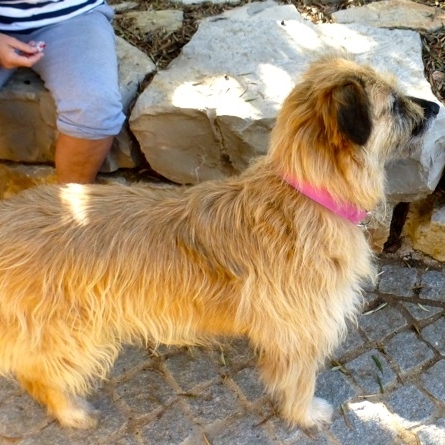 She was the oldest girl from our Porto, Serra de Freita rescue last year. She was in the container with 12 other dogs, males and females and not neutered. In January 2015 she started scratching and biting her own fur. Whatever we tried nothing helped and it just got worse and worse. We did skin scraping tests and she has Staphylococcus Intermedius which has invaded all her skin and inside the ears. We started a course of special antibiotics but 2 weeks ago on Sunday she was very ill and had a fever of 40.5 so we took her as an emergency to the clinic in Faro. 5 days later we fetched her like this! 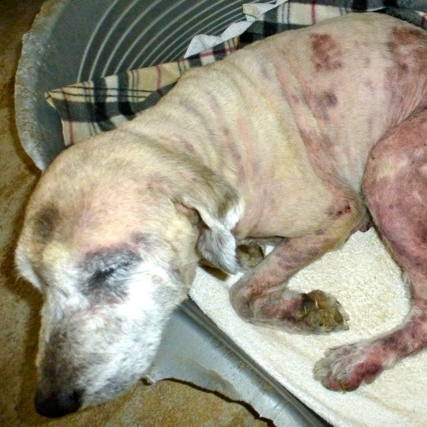 Completely shaven, red/purple patches all over that had been hot-spots and she was very depressed. 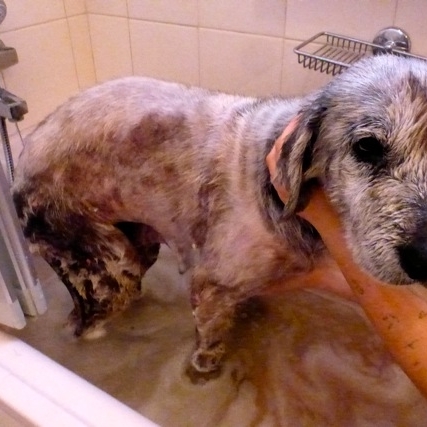 They changed her medication completely and she has to have a bath every 4 days with a special shampoo. Thursday she was washed again and she is improving but it will take months for her fur to grow back. At the moment she wears Adrian's old T shirts with safety pins in the neck part and a knot at the hind part. We believe she is about 10 years old. Bruna came to us as the result of the second rescue trip together with her only son Brunetto, then about 3 weeks old. They were rescued out of a cell with little light, see picture. Because she still is so afraid of everything, including afraid of daylight, we believe that she was not allowed to leave her prison cell ever. She lives in one of our "hospital" kennels in our garage. In spite of the fact that the door is open all day and other dogs come in to share her basket, the only thing she does is sit upright in her basket and look at the other dogs. She never ever comes out in the daylight or lies in the sun. She does not enjoy life at all. We have never experienced a dog so traumatised. She is the worst example of how people can mistreat a pet animal. Bruna will never ever be ready for adoption. We expect she will die in the basket where she sits now without ever having enjoyed her freedom. Update 18 August 2015. Now more than 1 year later she runs out of the kennel in the early morning with all the others, runs round the garden like a greyhound, takes a quick dip in the pool and then goes back into hiding for the rest of the day, every day, behind the bars of her open kennel...so sad but this autumn/winter we will work with her on a long rope and see if we can get her a bit more socialised..who knows. I think personally that she's a lovely dog just waiting for someone to help exorcise her demons! Update 13 March 2016. Bruna is now almost 2 years with us and changes for the better have happened. She is out in the sun almost all day. She barks with the others and runs around and enjoys her freedom. She comes to sniff our hands but before we can react she is gone again. 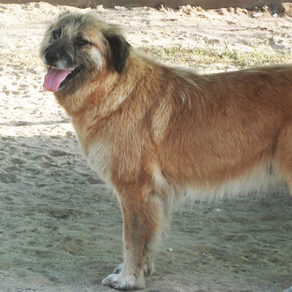 Sissi was rescued in the second rescue trip and kindly taken in by Dogs of Portugal in their shelter. She was rescued out of a cell with no light at all. Because she was so afraid of everything, afraid of daylight, afraid of people and even afraid of other dogs, we believe that she was not allowed to leave her prison cell ever. 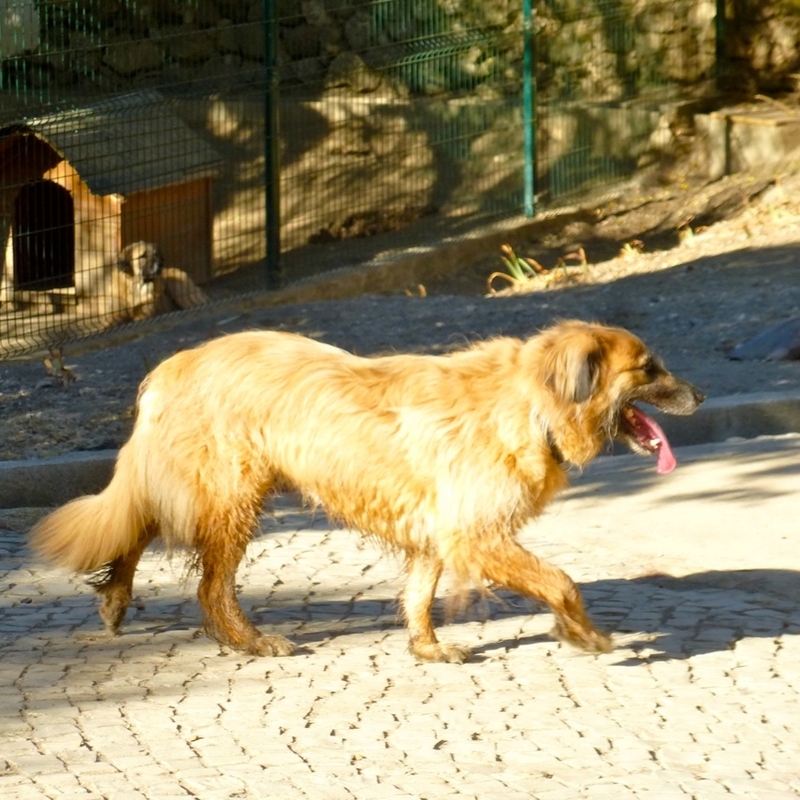 Dogs of Portugal welcomed in their shelter not only Sissi, but also King, Bela, Conde and Lord. They all were very shy although since they arrived they have made progress. This is what Dogs of Portugal writes about Sissi. Sissi was the most social of them from the beginning. And since then she has only become better. With some hesitation but now she comes to people and she walks on the leash. 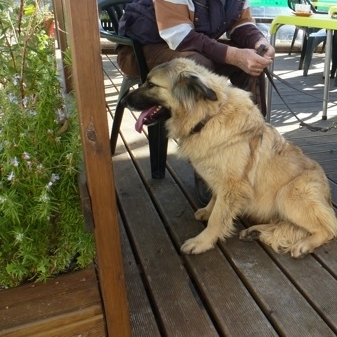 She is gentle and calm and social with other dogs. We hope she can go to a nice, calm home and spend the rest of her life surrounded by love to compensate for what she has been through.